Want To Lose The Wait? Many people would like to lose weight, but many more may want to lose “wait”, although they may not think about it in those terms. Waiting on God can be a frustrating thing. Imagine with me for a moment of a world without waiting. No smells of the fine cooking coming from the kitchen as you wait in anticipation of the flavors dancing in your mouth. No waiting in anticipation as a child waiting to open the Christmas gifts. Perhaps no one wants to wait in line to buy the anticipated gifts anyway. Don’t bother enjoying that movie night, the ending is now instant. No waiting seems like such a loss of treasured memories. You have accepted the fact that next Tuesday cannot arrive until then. All of history would need be condensed into the now without this thing called waiting. Would all the prophecies of the Bible be erased (since there was no waiting) and be updated by telling a historic perspective? The vision came immediately and you most certainly have heard about it by this time. The promise came without delay, and if there was such a thing as waiting–but there is not, I would then look forward to the anticipation of the next thing in line for me. When it comes to waiting on God, we think we know best about the timing of it all. If we never had to wait on something from God, would it void this thing we know as faith? Faith is not a lonely thing you use to get what you want; it is an interactive thing that is rewarded by waiting on God’s perfect time to deliver His promise. For the vision is yet for the appointed time; It hastens toward the goal and it will not fail. Though it tarries, wait for it; For it will certainly come, it will not delay. We should be able to be at peace with the wait, since it is God himself that is delivering us through the situation. The battles you face are won or lost in the wait time first, long before they become part of our physical world. When our expectations and desires are counted all lost, it is most often because we failed to manage the wait. Inspiration to wait on God is the spiritual truth that has not yet been experienced in the natural–nevertheless it is just as real. 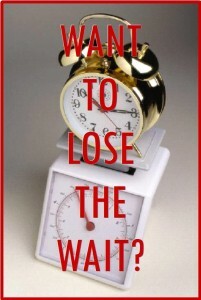 Do you really want to lose wait? Can you see what an impossible thing that is and how interactive waiting on God is meant to be? Enjoy the anticipation of what God will do next as you wait—knowing it will be in His time–the way you wait on the natural events in your life. Therefore be patient, brethren, until the coming of the Lord. The farmer waits for the precious produce of the soil, being patient about it, until it gets the early and late rains. You too be patient; strengthen your hearts, for the coming of the Lord is near.